EASTON (January 30, 2017) – As the local leader for Lehigh Valley Greenways Conservation Landscape, Delaware & Lehigh National Heritage Corridor (D&L) is preparing to disburse $75,000 as part of the 2017 Lehigh Valley Greenways Mini-Grant Program. The online application period is now open and runs through Friday, March 3, 2017 at 4:00pm. Lehigh Valley Greenways mini-grants are intended to inspire collaboration to carry out ready-to-go, single-year projects that protect and promote the natural resources of the Lehigh Valley and advance the goals of Lehigh Valley Greenways. 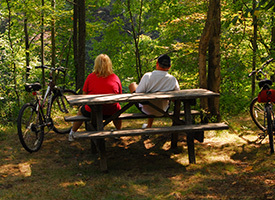 Land conservation & restoration, outdoor recreation & trail connections, community revitalization, and local education & outreach are among Greenway goals. Eligible applicants include municipalities, municipal agencies, county conservation districts, educational institutions (colleges, universities, school districts), and non-profit organizations with both tax-exempt 501c3 status and registered with PA Bureau of Charitable Organizations. Projects must be located within Lehigh or Northampton County. Please note that projects along the D&L Trail in Carbon and Luzerne Counties should apply to Pocono Forest and Waters Conservation Landscape for mini-grant funding. The current application cycle will be awarded in April 2017 for single-year projects to start and end between May 1, 2017 and July 31, 2018. Grant requests should be a minimum of $1,000 and maximum of $10,000 with total project costs at least double the grant request. Mini-grants must be matched with cash and/or eligible in-kind contributions at a minimum 1:1 ratio. Interested applicants can review full mini grant guidelines and fill out the online application on the Lehigh Valley Greenways website. All applicants are requested to send a representative to the pre-application meeting on Friday, February 17, 2017, 1:00-3:00pm at Jacobsburg Environmental Education Center, 400 Belfast Road, Nazareth, PA. 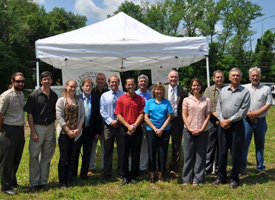 The grant awards are part of Lehigh Valley Greenways Conservation Landscape program and funded by the Pennsylvania Department of Conservation and Natural Resources (DCNR), Bureau of Recreation and Conservation, Environmental Stewardship Fund. Lehigh Valley Greenways mini-grant funds may not be used to match other DCNR funded grant projects. For more information on Lehigh Valley Greenways and the mini-grant program, please contact Claire Sadler at 610-923-3548 x226 or Claire@delawareandlehigh.org.